These wholesome energy balls pack lots of fruity flavor and health benefits for your gut. Dates*, sunflower seeds*, Jerusalem artichoke powder*, linseeds*, 6% aronia powder*, almonds*. *Certified Organic. This product contains Almonds, and may contain traces of other Nuts, Sesame, Mustard Seeds, Soy and Celery. 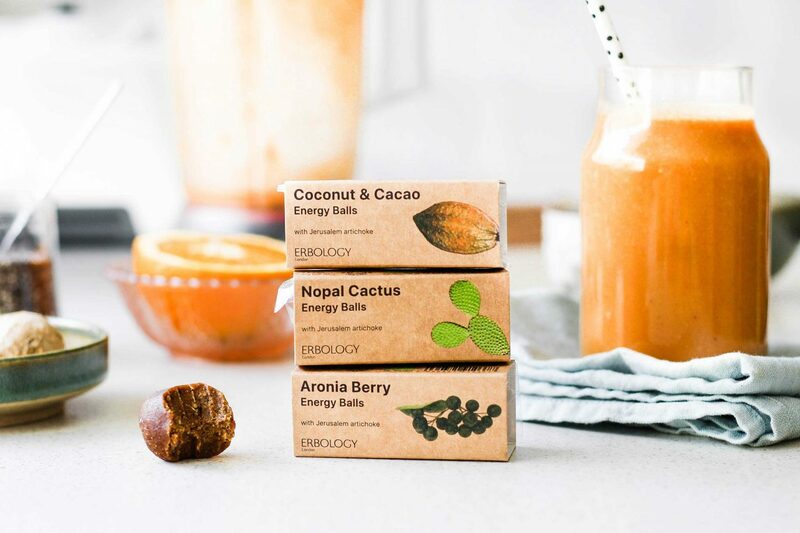 Our organic energy balls are unique. Besides being free from gluten and added sugar, they are made with raw plants. This means that each ingredient retains its excellent nutrients. One of these ingredients is Jerusalem artichoke. Also known as sunroot, Jerusalem artichoke is naturally high in inulin fiber, known for its prebiotic properties. Inulin is non-digestible and goes all the way to the bowels. Here, it is used by the gut microflora that promotes digestion and boosts immunity. Aronia is another brilliant ingredient in our energy balls. This deep purple berry is chock-full of anthocyanins – a type of antioxidants that have been studied for their support of cognitive and heart functions. These sweet treats are ideal as an afternoon snack or right before a workout. We also love to crumble them on top of porridge or smoothie bowls for extra flavor and energy. Store in a cool, dry place. Once opened consume within 10 days. This smoothie recipe is a perfect way to kick start your morning and takes less than 5 mins to make. 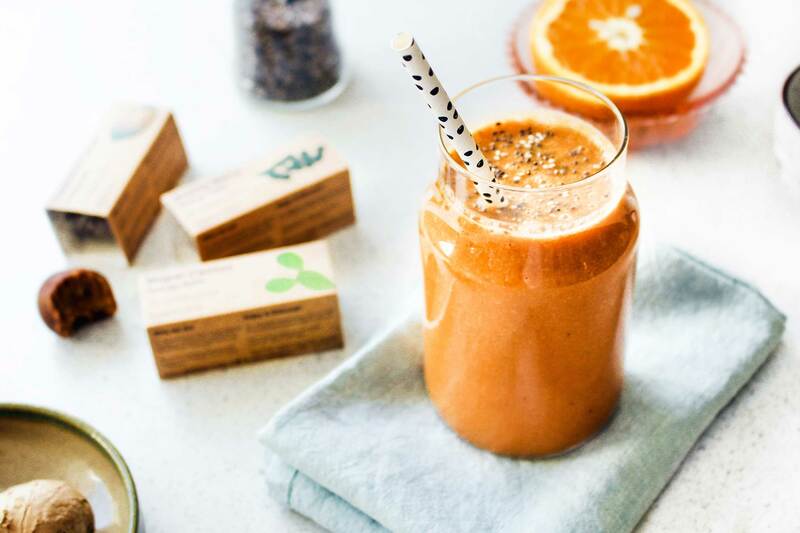 First, in a high speed blender mix ½ cup unsweetened almond milk, ½ cup chopped carrot, 1 orange, 1 tbsp roughly chopped ginger, 1 banana and a pack of Erbology Energy Balls. Then, pour the smoothie into a bowl or glass and decorate with ⅓ tsp chia seeds.